“Is there such a thing as insanity among penguins?” The question is one of many, just as striking, that legendary filmmaker Werner Herzog has posed through his work. The Montgomery Fellow returned to Dartmouth last month for a five-day residency, the highlights of which included a memorable presentation Wednesday, September 18 in Spaulding Auditorium that I was lucky enough to attend. A landmark of the New German Cinema—although he prefers “Bavarian Cinema”—and the creative force behind over 60 films, including Aguirre, the Wrath of God, Fitzcarraldo and Nosferatu and documentaries such as Grizzly Man, The Cave of Forgotten Dreams and Encounters at the End of the World, Herzog presented a reel of clips from his work and sat down with Film and Media Studies Associate Professor Jeffrey Ruoff for an onstage conversation followed by an audience Q&A session. But there is also beauty and poetry is his work, and sometimes even a pervasive sense of joy, perhaps the pure joy of filmmaking. His oeuvre chronicles a search for truth, for what he calls “illumination,” a fascination with the uncommon, the extraordinary and the sublime, the outcasts and the misfits. “Imagination is not as wild as reality can be,” Herzog argues, but, looking at his creative work, one wonders. “I’m surprised some of it is as fresh as when [the films] were made,” the director said after watching selected clips from his movies. “Aguirre looks as if I had done it yesterday,” he continued; “it has a lot of life in it.” The movie was made with an almost nonexistent budget and a crew of eight. “Money doesn’t move mountains,” Herzog explained. “It’s faith that moves mountains. Money doesn’t move a ship over a mountain either,” he told the audience, referencing the famed feat he accomplished while making Fitzcarraldo. In terms of planning and preparation, the filmmaker believes directors who work from detailed scripts or storyboards are the cowards. The script for Aguirre was written over two days, on a bus full of drunken German soccer players. Every once in a while someone would through up on Herzog’s typewriter and entire scenes were thrown out the window, never to be rewritten. The well-known break-dancing/iguana hallucination sequence from Bad Lieutenant: Port of Call New Orleans was wholly improvised. “I had an iguana around,” Herzog explained. Of course he would. Herzog encourages aspiring filmmakers to embrace the same originality, spontaneity and ingenuity. When asked about film school, the director replied, “I’m skeptical of school in general. I’ve always hated school… I’ve never trusted a textbook. I’ve never trusted a teacher.” His advice for learning how to make films is to explore the world on foot and to read. 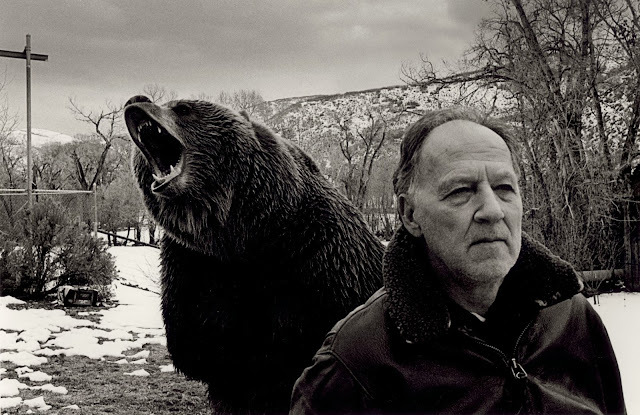 The only skills a filmmaker needs, in Herzog’s opinion, are shared at his own rogue film school. “How to pick locks and how to forge documents—like gun permits—are the only technical skills I teach,” he said.